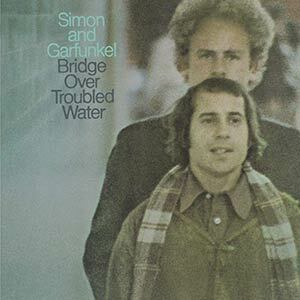 Bridge over Troubled Water is Simon & Garfunkel’s fifth and final studio album, which was recorded in 1969 and released in 1970. It demonstrates Paul Simon’s extraordinary confidence in song-writing, willingness to evolve the duo’s essential sound, and includes two of their greatest achievements – the title track plus The Boxer. There’s a melancholy at the heart of the album, and (extraordinary how often the two emotions conjoin) nostalgia, which is no bad thing. But the music was, by this time, a long way from the somewhat twee and strictly acoustic sound that had launched their careers. The background is that it had become inevitable that Paul Simon and Art Garfunkel would go their separate ways following the recording. Indeed, Garfunkel’s absence, whilst he took a supporting role in Mike Nichols’ Catch-22 movie adaptation, is paramount in Simon’s songwriting. From the bombastic title track’s lyrics “and friends just can’t be found”, to the autobiographical The Only Living Boy in New York (“Tom” is Garfunkel, and Simon narrates his isolation), and So Long, Frank Lloyd Wright, a nod to Garfunkel’s early intention to train as an architect, the album is replete with heavy hints that, as a duo, they are going out on a high, never to return. The opening song, Bridge over Troubled Water, is in many respects, indicative of the working relationship between the two. Simon composed the songs, and Garfunkel contributed, in this instance a third verse and solo vocals. Overall, Garfunkel’s voice is richer and stronger, but he lacks Simon’s gift for songwriting. Together, though, their talents can produce a masterpiece like Bridge Over Troubled Water. There are upbeat songs and moments on the album, but often the content belies the emotion evoked by the music. Cecilia, with its peculiar percussive sound, is about being heartbroken by the infidelity of a partner who doesn’t feel the same way. The rousing Keep the Customer Satisfied, which is sure to have your foot tapping along, concerns a Willy Loman-style salesman who has fallen foul of the law and seems to be spinning towards a breakdown. Besides the title track, perhaps the duo’s greatest song in terms of musical artistry is The Boxer, and it opens the second side of the album with the same big impact as the title song. The build up to the climax, with the “lie la lie” refrain, has an incredibly powerful emotional punch, and is also one of the catchiest melodies ever written. Simple, but mesmerising. Other tracks have a simpler, quieter structure, such as So Long, Frank Lloyd Wright and the Peruvian song El Condor Pasa, but these more reflective moments have a beauty of their own and are counterbalanced by the neuroticism of the up-tempo offerings. The album remains in harmony between emotional states, neatly demonstrated by the final two tracks, the live recording of Bye Bye Love, in which the audience claps cheerfully along to a heartbreaking sentiment, and the short, sweet Song for the Asking, on which note, the duo sign off. Bridge over Troubled Water continued Simon & Garfunkel’s move away from purely acoustic guitars with vocals to a fuller, more heavily-produced, richer sound that required the support of backing musicians. It is perhaps their most confident achievement, even if Simon wasn’t in the best place when he wrote it. Nevertheless, the vicarious pleasure of tapping into another’s thought processes and emotions, even pain, is alluring when packaged in such profound and accessible songs. Everyone will have their favourite, but there isn’t a bad track on the album. That their differing emotional states hang so well together and support one another is reflective of the truth and power of the songwriting. It’s a shame they didn’t record together again in the studio, but all good things come to an end, and it’s always a good idea to go out on a high. Their sound is one of the defining features of the 1960s popular music landscape. Bridge over Troubled Water has never sounded better than in stereo and on 180 gram vinyl. If your only copy is a thinner one picked up from a charity shop, this is the ideal opportunity to upgrade to the real deal, for a better sound experience. See also our review of Simon & Garfunkel’s Parsley, Sage, Rosemary and Thyme.